Review date: 20 August 2002. Loudspeakers, generally, have rectangular boxes. 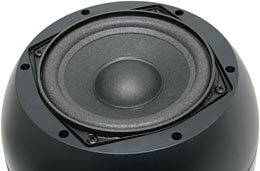 Loudspeakers are normally rectangular mainly because rectangular boxes are easy to make. Loudspeaker manufacturers also need flat surfaces to mount the actual speaker drivers and other components on, and rectangular boxes can be sized so that their three dimensions aren't exact multiples of each other, which reduces resonance problems. But, basically, the boxes are rectangular because that's easier, and thus cheaper, to make. The above-pictured funny-looking speakers are Altec Lansing's XA3021 "2.1" channel (two little satellites, one big subwoofer) system. 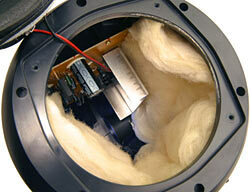 All three speaker enclosures in the system are basically cylindrical, with flat panels only where the drivers mount. They manage to be this shape because they're made of moulded plastic, but that's not necessarily a bad thing for little speakers. And they look, frankly, hilarious. In a good way. The satellites look like Shure 55-series microphones (read all about those in PDF format here); this styling note has previously been seen in certain vapourware 1.2GHz Macintoshes of yore. The subwoofer, in contrast, looks not unlike an explosive device made by the craftsmen of Acme Corporation, ready for use by a luckless consumer. 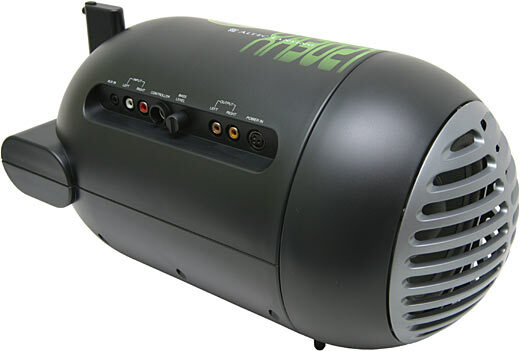 Since the speakers are somewhat black-and-green and the box they come in is very black-and-green, Altec Lansing are clearly targeting the Xbox market with the XA3021. These are general-purpose speakers, though; you can run them from any plain old line level stereo input you want. 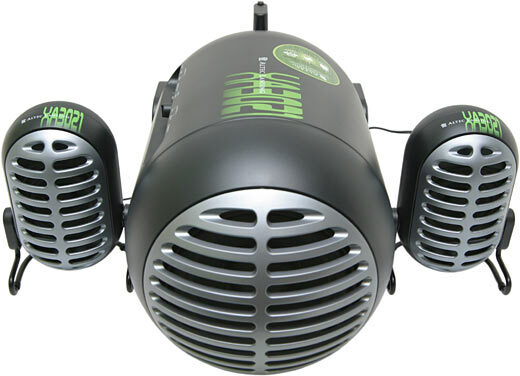 And, despite the peculiar styling (Altec Lansing call it "gnarly"), the XA3021 system isn't terribly expensive. Here in Australia, Aus PC Market have it for a mere $AU209 delivered (well, they did; this review dates to mid-2002, and they don't stock these speakers any more). US buyers will pay even less; a quick Price Watch search turned up five dealers all selling the XA3021 system for less than $US70. Which is about $AU130 - not that any Australian is going to be rushing to order a large box full of 110 volt electronics from the States. These US prices don't include delivery, of course, but you're still not talking a whole lot of dollars for this stylin' speaker system. Funky design matters little if the speakers have a dreadful user interface, are built like a Polish Fiat copy, or sound like a transistor radio in a Milo tin. Fortunately, the XA3021 kit acquits itself quite well in these areas, too. 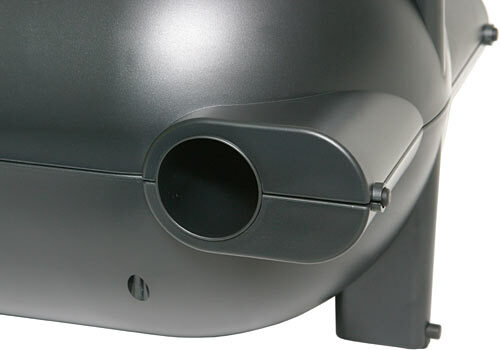 The XA3021 connector panel is on the side of the subwoofer bomb. The system uses standard RCA connectors for its main input, but there's also a 1/8th inch stereo socket auxiliary input. There's no way to switch between the inputs; they just talk over each other, if you connect them both. The outputs for the satellite speakers also use RCA connectors, which is an OK solution for low power speakers like these, and makes it impossible to connect the satellites out of phase (negative wire to positive terminal and vice versa). Which is a good thing. The satellites come with roughly 2.5 metres of cable each, which should be more than enough for most setups. With the XA3021 kit, you get a stereo RCA-to-RCA lead of reasonable length, and one RCA extension lead, so you can set up one satellite much further from the sub than the other. If you want to use the 1/8th inch connector, or hook up either XA3021 input to a PC or other gadget with a 1/8th inch output socket, you'll need another cable. There's only one control on the subwoofer - a knob which lets you set an, um, baseline bass level. Power comes from an unremarkable lump-in-a-wire transformer, with a 12.5 volt, 2.5 amp rating. Multiply that out and you get a maximum possible power rating for the system of 31.25 watts. Take into account some measure of kindness to the power brick and the inefficiency of the amplification system, and 20 watts is plausible enough. 20 watts is, in fact, the XA3021's power rating. But, as is normal for cheapo speakers, you wouldn't know that if you didn't look closely at the specs. Altec Lansing's page for the XA3021 claims 40 watts "total system power", but the Adobe Acrobat format brochure for the system admits to the actual RMS rating. 20 watts is plenty for domestic purposes, mind you, even from speakers that aren't terribly efficient. Thanks to the logarithmic response of the human ear, to get twice the loudness you need ten times the power. Which means that 40 watts sounds only about 23% louder than 20. The Altec Lansing brochure also claims 35Hz to 18KHz frequency response from the three drivers in the XA3021 kit, which is a pretty darn hopeful specification that's also in the great tradition of cheap speaker marketing. But we'll get to that shortly. ...this. The wired remote is another curvy item, and it provides all of the XA3021's everyday controls, including the power button. It's on the end of a cable about as long as the satellite speaker wires, and it's got rubber feet on the back, so it stays put quite well. The volume control on the remote looks like a jog/shuttle dial, but you can't actually turn it all the way around; it's a normal volume knob that can only be turned from roughly the 7-to-5-o'clock positions. The dial has a pleasant soft-touch feel; it's a bit weird to have a volume control that you can't grab, but the thing's useable. 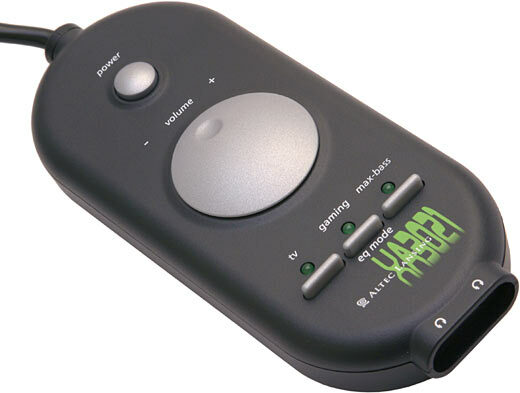 Below the volume control are three buttons for different equalisation modes - TV, Gaming and Max-Bass. The modes are obviously different, but only in the bass register, so far as I could hear; TV sounds a bit thin unless you've wound up the sub's bass knob, Gaming is a bit beefier, and Max-Bass is likely to overpump the poor little sub at more than moderate volume levels. The remote also sports not one but two 1/8th inch stereo headphone sockets, which according to ancient protocol mute the speaker output when you plug something into them. In this case, the muting's obviously done in a somewhat more clever way than the usual little direct cutout switch, because it takes a moment after plugging the 'phones in before the speakers go quiet and the 'phones start doing something. Still, the sockets work fine, and this is a feature that some users will definitely appreciate - it lets a couple of people watch movies or beat the snot out of each other in a console game without bothering the rest of the household. There are other ways to multiply your headphone sockets, but this is an elegant one. Like practically every other tiny multimedia speaker sub, this one uses a ported design, with a tuned tube coupling the air mass inside the enclosure to the air outside. The port pokes out the side of one of the two fatter fins. This layout, plus some kindly provided rubber feet on two sides of the enclosure, mean that you can use this sub standing on its tail or lying on its side. You should, if possible, try both alignments, and also move the sub around and change the direction the port points in, to see what setup gives the best sounding bass in your listening location. The subwoofer speaker is specified as a "5.25 inch" driver, but that figure's only correct if you measure most of the way out to the mounting holes, well beyond the actual air-moving piston area of the speaker cone. Speaker sizes are always stated like this. The actual cone of this driver, measured generously out to the middle of its foam roll surround, is about 4.5 inches in diameter. For the same reason, the "three inch" satellite drivers are really only about two and a third inches in diameter. If you squint. And use a suitably small value of 2.33. All three XA3021 speaker cabinets are quite solidly sealed. There are eight screws fastening the two halves of the subwoofer cabinet together, but it shows no signs of coming apart even after you remove them; the satellites don't even have screws. This is good news for the cabinets' long term survival - speaker cabs that aren't solidly held together can end up whistling and buzzing - but it makes it harder to look inside. Fortunately, you can get an OK view of the innards by simply unscrewing the drivers. Inside the satellite speakers, there's... not much. No lagging material, no electronics. There's no need for a crossover in a single-driver speaker, of course, and small cabinets can get away with minimal lagging, but the basically cylindrical design of these little cabs does mean that they'll have a couple of fairly pronounced resonances. By hi-fi standards, there's pretty much no way for these to be very good speakers, but they're on par for cheap multimedia speakers. On the plus side, there is at least a blob of sealant where the speaker cable enters the enclosure, and there's also a strip of vinyl tape to stop the wire from buzzing against things. The speaker driver has a ring of sticky sealant tape around it, which means these little enclosures should be quite airtight. That's good. The satellite speaker drivers are Altec Lansing's usual own-brand anonymous units, without any power rating printed on the back. They're magnetically shielded so you can use them near a CRT monitor, but this means their apparently quite large magnet assemblies actually contain two back-to-back magnets to cancel the external magnetic field. The real power handling and efficiency for these drivers are therefore not going to be very exciting. 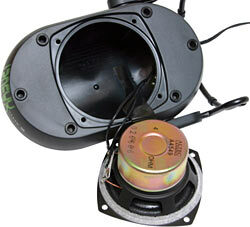 The subwoofer driver's also a hard-to-identify Altec Lansing product, but it's obviously not a top-spec unit. The unshielded magnet's not large, and the driver frame is the plain stamped metal type. Perfectly adequate, and the sort of driver that you always find in cheap multimedia speakers, but not something that justifies any of Altec Lansing's industry standard marketing puffery. The sub driver fits tightly into the hole in the end of the enclosure, and it's got another ring of sealing tape around it. Inside the subwoofer, there is a generous amount of lagging material, which should significantly reduce the resonance problems that're normal in tubular enclosures. Tubular subwoofers are quite popular in car audio and other restricted-space applications, because they don't take up a lot of room, but can deliver impressively low bass for their size. The price you pay for this is resonance; tubular subs like to play a couple of notes a lot more than they like to play all of the others. The dinky subwoofers in multimedia speaker systems always have considerable resonance issues, though, regardless of their box shape; they're deliberately tuned to deliver a big fat hump in their frequency response that gives anyone who's not listening too hard the impression of a decent amount of bass. In this case, the tubular cabinet design just helps the sub to achieve its design goal. Given how small this sub is, though, the natural cabinet resonances will be way up in the mid-bass, so the lining of sound-absorbing fibre-stuff will do more good than harm. What, exactly, this fibre-stuff actually is, I'm not sure. It's brittle and prickly, so my first thought was that it was glass wool, as seen in many older loudspeakers. Fibreglass lagging - the same stuff that's used in glass roof insulation batts - is acoustically pretty good, but it can pulverise and sag when it's subjected to vibration. 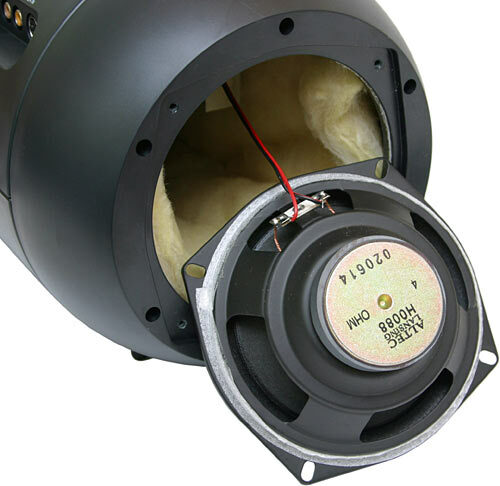 If you use glass wool in ported speakers like this little sub, the port will blow glass dust into the room whenever the bass is pumpin'. Inhaling lots of silica is not a hobby you should pursue if you're interested in being around to see the next pass by Halley's Comet, but there's no reason to suppose that speaker cabinets pose a significant risk. The stuff still makes me feel irrationally nervous, though. In any case, picking out a tuft of the lagging and following my basic dictum that it's always a good idea to set stuff on fire revealed that this isn't glass fibre. I presume it's some unusually crinkly and yellow relative of the white fluffy cellulose-based lagging that inhabits most modern speakers. Along with the fuzzy stuff, the XA3021 sub contains an unremarkable circuit board dominated by a couple of integrated amplifier everything-chips. The board's a cheap single-sided effort, but space isn't at a premium inside the sub so that doesn't matter. There's a decent heat sink on the main amp chip, and everything seems to be assembled to a higher standard than I'm used to seeing from the hang-board-on-wall-and-throw-solder-at-it super-cheap brigade. The inside of the sub's little port is flared slightly, which both rounds off its resonance characteristics and reduces the organ-pipe "chuffing" sounds that small ports otherwise like to make. 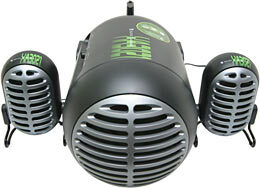 In use, the XA3021 speakers make an agreeable enough noise. The little satellites aren't stunningly good for their size, but they've got OK drivers in them and are solidly enough constructed, and their rubber-footed supports won't buzz on a table. They also have a simple click-stop angle-adjustment arrangement, so you can aim them at your ears easily. The sub ain't too bad, either; when it's trying to reproduce genuine bass it either does nothing much at all (in TV mode), or provides a vague mid-bass contribution (in Gaming mode), or overcontributes and embarrasses its little resonant self (in Max-Bass mode). But that's really all you can expect from a cheap sub like this; if you want to knock dust off your ornaments, you need a bigger box and a bigger driver. Hooking the XA3021 up to my tone generator produced entirely unsurprising results. The sub's in-room response falls off precipitously below about 100Hz, and if you expect any actually useful response below about 70Hz, your expectations will be unfulfilled. Still, it doesn't rattle or honk or buzz if you're not pushing it too hard, and its mid-bass response hump is no worse than that from various other speaker systems at this price point. My flabber remained conclusively un-gasted by the XA3021's bass response, but I wasn't disappointed, either. Taking the grilles off the satellite speakers crispened them up a little bit. 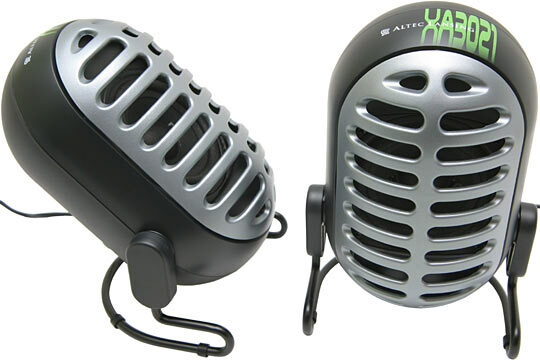 The XA3021 grilles are all moulded matte-silver-finish plastic, with thick retro Shure-mike bars. Those bars, at treble frequencies, reflect enough sound back onto the driver and the front baffle to considerably smear the response of the satellites, not to mention quieten them a little. The difference between grilles-on and grilles-off really isn't anything to get excited about, though, and the grilles protect the paper-coned drivers effectively as well as looking groovy, so you might as well leave them on. The grilles, by the way, are fixed in place with simple rubber-sleeved pegs, which hold them solidly but won't let them buzz. The XA3021 system is reasonably cheap, very cheerful, and it gets the job done. If you want surround sound, go elsewhere. If Sir desires something beige and square, then Sir will similarly find himself poorly served by this product. And, of course, if you want real high fidelity reproduction, you're not going to get it from this or any other multimedia speaker system. If you want something that sounds OK for the money, though, the XA3021 does. And, as a bonus, people tend to laugh out loud when they see it. These aren't the multimedia speakers for everybody, but I like 'em. Recommended. Aus PC Market don't sell these speakers any more (click here to see their current speaker range), but you can still try a price search at DealTime!